Stikbold! A Dodgeball Adventure Deluxe is the kind of game that you play for a while, enjoy it while it lasts, and then, a few weeks later, forget that you’ve ever played it. It’s a game that commits no crime against game development, but neither does it inspire. It’s meant to be lighthearted and fun, but there's a fine line between that and being forgettable... and unfortunately this one steps over that line. Related reading: For a second opinion on Stikbold, read our review of the original release on PS4 here. I digress. The point of this narrative is, mostly, to take our two "heroes" from one bunch of opponents to the next, beating them down so they’ll point the duo in the direction that the love interest is being carted. But this is no fighting game. Rather than fighting these opponents, you get to beat them through good, honest games of dodgeball! The dodgeball mechanics are ridiculously simple. You can either pass the ball to your team mate, fire it at the opponent, or, if the opponent has the ball and you’re close enough, push them so they’ll drop the ball. At first you'll be firing shots off in the same direction that your character is facing, but it won't take too long to master the art of dual-stick shooting (not that it'll be necessary for the most part), and even learn to throw a curve shot in there. The goal is to throw the ball directly at the opponent; the first time it hits it will “stun” them for a short period of time. Hit them a second time to knock them out of the game. Do this for each opponent before they KO your team, and you’ll win the round. The first thing you need to know is that the game doesn’t actually conform to the rules of dodgeball whatsoever. Real dodgeball segments teams across two halves of a playfield, but this one lets you roam anywhere. Real dodgeball is actually a game of skill and precision. 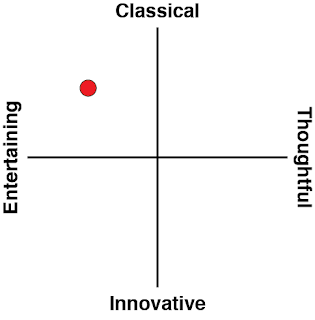 This is a game that’s far too simple to require precision. Sure, actually hitting an opponent isn’t easy if they’re zigzagging around and diving over the place. This is particularly true of long shots, and to the game’s credit, it does do a good job of highlighting a successful longshot as a trick shot “achievement”, which then becomes the perfect sledge in a multiplayer match. 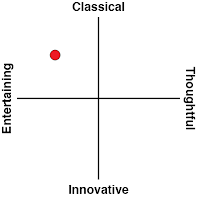 But the mechanical depth of the game is non-existent, so the fact that it’s hard to hit your opponent simply makes games between evenly matched players laboriously long… and from there, "long" quickly becomes "dull." To try and spice things up the levels themselves have gimmicks; one level has a hippie fan periodically show up to speed around the outer rim. A beach level has waves show up to cut across the middle of the level. This is where the game is most like the Mario Sports games, which also often have gimmicks to add depth to the otherwise simple gameplay mechanics, but in this game’s case, those gimmicks are too easy to avoid and too pedestrian in design to create those outrageous moments of last-second win hilarity that sustains the Mario Sports franchise. 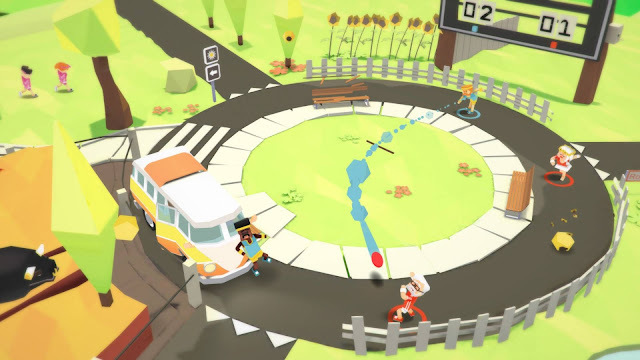 All you’ve got with Stikbold is brightly coloured characters throwing a ball at one another. Play cooperatively and there’s little reason to use teamwork, and the tactics aren’t much more complex than “pass the ball to give your buddy a closer shot at the enemy." Play competitively and actually being able to knock the other team out becomes a laborious challenge because it's simply too easy to get out of the way. 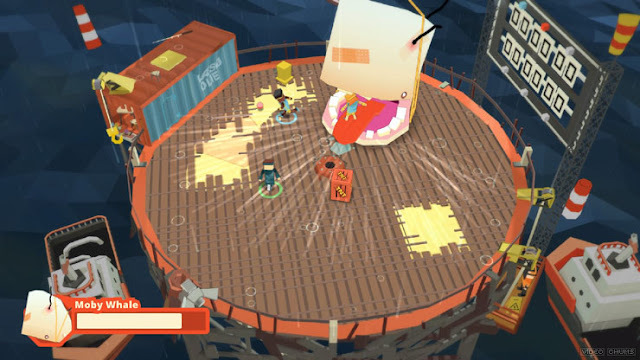 The one exception to the sheer monotony of both the single player and multiplayer modes is the “Wheel of Rumpus” mode, which overlays a gameshow-like element to the competition. 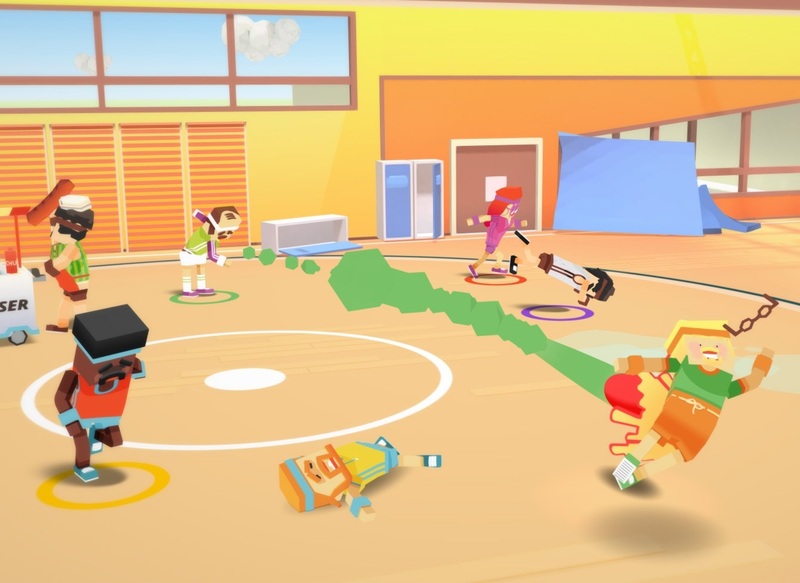 There’s some potential in this mode; in addition to the basic dodgeball action there’s a couple of minigames, such as a soccer (or handball)-like “score points by stealing the ball from your opponent and then throwing it into the goal”, and which of these games you'll be playing is determined by the spin of a wheel at the start of each round. Players can earn items and the like by playing well too, and the first person to hit a certain number of points wins the game. Sadly it doesn’t take long to realise that the wheel is just arbitrary and all you’re doing is competing to win a certain number of games first, and the minigames do become monotonous even more quickly than the main dodgeball action. The game really needed that narrative to give the overly simple gameplay some context to make it worthwhile, but the cut scenes are just not that great, and the jokes aren’t worth much more than half a chuckle. What the game does get right is the aesthetics, which are bright and colourful, and the blockiness of the characters is silly and charming. It’s damning the game with faint praise, but there’s a little ditty that plays after a victory as the scoreboard pops up, and that’s a highlight of the game, because it’s just irritatingly infectious enough to rub additional salt into the wound after a loss. 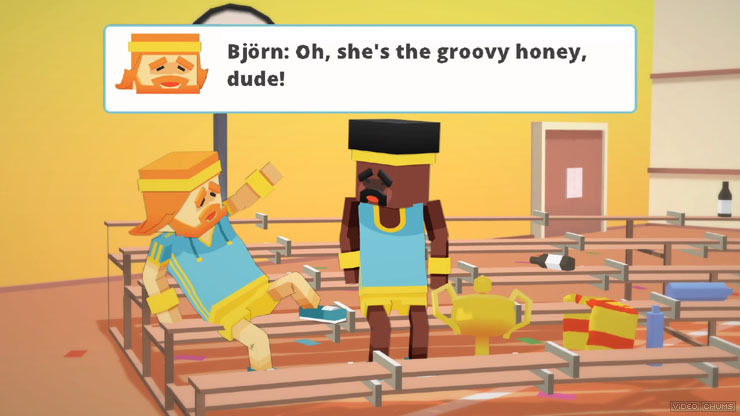 Stikbold lacks any kind of narrative or gameplay substance to be a compelling single player game. Sadly, it’s all too simple to be an effective multiplayer title, either. It’s passingly fun; I sat down with my wife to multiplayer it, and she enjoyed it for ten minutes before we decided to go back to Overcooked. Overcooked is a good example of a casual multiplayer game that anyone can pick up and have a lot of fun with immediately, but will continue to challenge and delight for hours afterwards thanks to the way it steadily ramps up the demands it places on your teamwork. Play Stikbold for a few hours and you’ll still be doing exactly what you did at the start, exactly the same way, and while there’s nothing offensive about that, it’s also not particularly memorable.